Press Release: Open Labs, LLC. and Linkin Park are announcing an ongoing contest with promotional partner Guitar Center. The Stagelight Monthly Music Contest is a year-long contest hosting original compositions from emerging talent all over the world, created in the flagship music creation software, Stagelight. The Monthly Music Contest enables anyone to compete for an impressive amount of prizes comprised of music software, sounds and hardware instruments. The vendor partners supplying the contest prizes are Arturia, Audio-Technica USA, Big Fish Audio, Blue Microphones, Dell, Fishman, Focusrite, IK Multimedia, JBL Professional, MVP Loops and UVI. Open Labs' ongoing relationship with Linkin Park and Dell continues to raise awareness of Stagelight: The Easy Way to Create Music, across the web and social media. Dell, a long-time vendor and partner of Open Labs, has been instrumental in connecting Stagelight to a growing audience of aspiring musicians and technology professionals. Each monthly winner of the Monthly Music Contest is entered into a "Final 12" group for a chance to win the grand prize: a Dell XPS 18 all-in-one computer and a creative mentoring session in the studio with Linkin Park. Hundreds of contestants from all over the world have entered Stagelight compositions. Musicians from the U.S. to India, Poland, Russia and more, have answered the call to create and share their music. 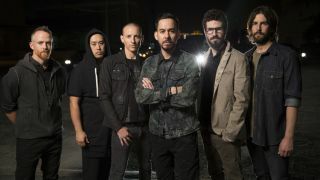 The winning tracks have been promoted and shared through Guitar Center and participating vendors and across the Linkin Park social pages, including the Linkin Park Underground, who choose the monthly winners from a top ten list based on user votes. Maurice David (AKA Skeeter) and "Life is a Deadline"
Richard Browning (AKA Soldiers 4 Light) and "OuterSpaceInYourFace"
Gurkanwar Singh Sra (AKA GK) and "Unbound"
Pawel Zwierzchowski (AKA ZwierR.Z.) and "Plethora"
Hero's Handbook (AKA Ben Van Camp) and "Spark"
Flares (AKA Marc Allen) and "Breathing Fire"
The Stagelight Monthly Music Contest is a great opportunity for people to compete for valuable prizes by creating a piece of music in Stagelight - an easy way for anyone to create music, designed for use on multi-touch PC's, without complicated technology barriers. Anyone can enter the contest by visiting this page and downloading a 30-day trial of Stagelight here.